This is the easiest way to implement AMR iOS SDK and ad networks to your current iOS Mobile App. Application Id provided in Admost Mediation Dashboard. Zone Id(s) provided in Admost Mediation Dashboard. You can install AMR SDK and mediation adapters using CocoaPods (recommended) or add AMR SDK framework files and mediation adapters files manually to your project. CocoaPods is a dependency manager for Swift and Objective-C Cocoa projects which automates and simplifies the process of using 3rd-party libraries like AMR in your projects. See getting started guide for more information on installing cocoapods. At least one mediation adapter is required for AMRSDK to show banners. You can add all adapters (recommended for maximized revenue) or start with a subset of adapters. Consult your AMR agent for further details. Please click + icon to add to list and - to remove from list. Podfile will be updated while you are choosing networks. After you complete pod installation you can skip to Xcode Setup step. Drag and drop following files in AMRDemo/AMR/Core folder to your project. Add following frameworks and libraries to your project. Create a folder called Mediation Adapters (name is optonal) and add adapters in AMRDemo/AMR/MediationAdapters folder. Make sure $(PROJECT_DIR) recursive is set in your target's Framework Search Paths in Build Settings. Add -ObjC and -lc++ flags in your target's Other Linker Flags in Build Settings. Add following lines to your plist file. Important If you are using AdMob you must add your AdMob App ID to your plist file with GADApplicationIdentifier key as shown below. Your App ID can be found on AdMob dashboard -> Apps -> App settings -> App info. Important If you are using AppLovin you must add AppLovin SDK Key to your plist file with AppLovinSdkKey key as shown below. 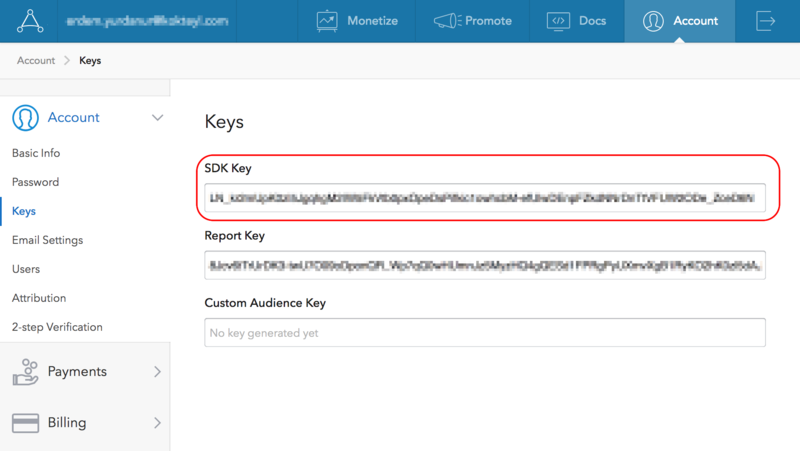 Your AppLovin SDK Key can be found on AppLovin Dashboard -> Account -> Keys. Once you have collected the user’s consent, you can pass it onto the SDK using the init configuration parameters shown above. setUserConsent has a boolean parameter. If you have the user’s consent, set it YES. If you do not have the user's consent, set it NO. subjectToGDPR has a boolean parameter. If you know the user is subject to GDPR, set it YES. If you know the user is not subject to GDPR, set it NO. If you don’t pass the user’s consent or subjectToGDPR to the SDK, the rules described in GDPR have been applied. Initialize it with your Banner Zone Id and set it's delegate to an object (generally your viewController) which conforms to <AMRBannerDelegate> protocol. Optionally you can set the width of the banner, default value is screen width. Start loading banner with loadBanner method and wait for the <AMRBannerDelegate> protocol callbacks. There are 2 callback methods in <AMRBannerDelegate> protocol. When didReceiveBanner callback method is called just add banner's bannerView as a subview on your viewcontroller to show banner. If didFailToReceiveBanner callback method is called investigate error to adress the problem. 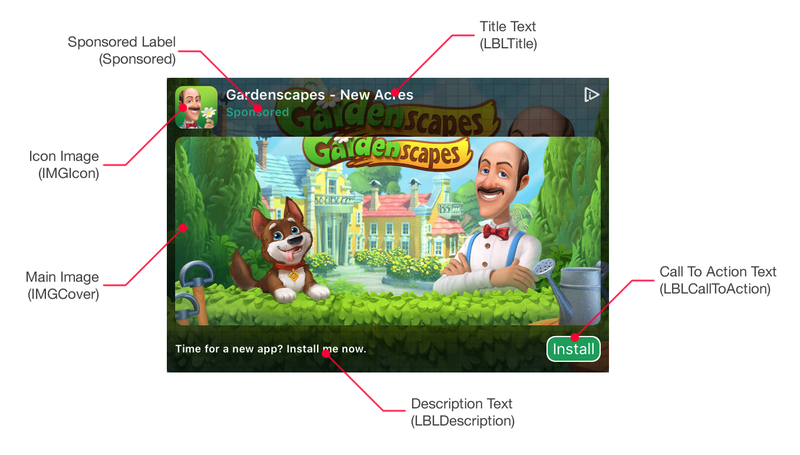 You can change the appearance of native ads to suit your application's design. If you are integration AMR with Cocoapods extract CustomXibs.zip in AMRSDK pod to your project. If you are manually integrating AMR add AMRDemo/Supporting Files/Assets/Natives/ folder to your project. If you want to use your own layouts you can create a copy and modify one of the custom sized samples (CustomNative150x250.xib, CustomNative200x200.xib or CustomNative300x120.xib) and change their frame to fit your design. Initialize it with your Interstitial Zone Id and set it's delegate to an object (generally your viewController) which conforms to <AMRInterstitialDelegate> protocol. There are 5 callback methods in <AMRInterstitialDelegate> protocol. When didReceiveInterstitial callback method is called just call the showFromViewController method to present interstitial from a viewController. If didFailToReceiveInterstitial callback method is called investigate error to adress the problem. didShowInterstitial callback method is called to inform the application that the received interstital is shown. didFailToShowInterstitial callback method is called to inform the application that the received interstitial failed to be shown. This delegate expected to be called very rarely but if it is called you should either load another interstitial or resume tasks. didDismissInterstitial callback method is called to inform the application that the interstitial is closed by clicking cross button/back button. You can use this callback to resume paused tasks during interstitial presentation. Called after didCompleteRewardedVideo delegate callback. Initialize it with your RewardedVideo Zone Id and set it's delegate to an object (generally your viewController) which conforms to <AMRRewardedVideoDelegate> protocol. There are 6 callback methods in <AMRRewardedVideoDelegate> protocol. When didReceiveRewardedVideo callback method is called just call the showFromViewController method to present rewarded video from a viewController. If didFailToReceiveRewardedVideo callback method is called investigate error to adress the problem. didShowRewardedVideo callback method is called to inform the application that the received rewarded video is shown. didFailToShowRewardedVideo callback method is called to inform the application that the received rewarded video failed to be shown. This delegate expected to be called very rarely but if it is called you should either load another rewarded video or resume tasks. didCompleteRewardedVideo callback method is called to inform the application that the user finished watching the video and can be rewarded. Use this callback to reward the user. didDismissRewardedVideo callback method is called to inform the application that the rewarded video is closed by clicking cross button/back button. You can use this callback to resume paused tasks during rewarded video presentation. Initialize it with your Offerwall Zone Id and set it's delegate to an object (generally your viewController) which conforms to <AMROfferWallDelegate> protocol. There are 5 callback methods in <AMROfferWallDelegate> protocol. When didReceiveOfferWall callback method is called just call the showFromViewController method to present offerwall from a viewController. If didFailToReceiveOfferWall callback method is called investigate error to adress the problem. didShowOfferWall callback method is called to inform the application that the received offerwall is presented. didFailToShowOfferWall callback method is called to inform the application that the received offerwall failed to be presented. This delegate expected to be called very rarely but if it is called you should either load another offerwall or resume tasks. didDismissOfferWall callback method is called to inform the application that the offerwall is no longer present. You can use this callback to resume paused tasks during offerwall presentation. The AMR DFP Adapter lets publishers integrate Admost Mediation Router ads into applications with DFP or AdMob Mediation set as main ad mediation layer. In order to show AMR ads in DFP/AdMob Mediation you should first follow dedicated steps of DFP or AdMob Mediation to set AMR as an ad mediation source. After adding AMR as an ad mediation source you should define class names for banner and interstitial ad custom events. Enter AMRDFPCustomEventBanner and AMRDFPCustomEventInterstitial class names for banner and interstitial class names respectively. You must pass your AMR zone Id to custom event via Parameter field. Include Admost DFP Adapter in your project after setup, if you are using CocoaPods add following line to ypur podfile and run the following command to install. If you are integration Admost manually add AMRAdapterDFP from AMRDemo/AMR/MediationAdapters folder to your project. Now you can show AMR banner and interstitial ads via DFP or AdMob Mediation. 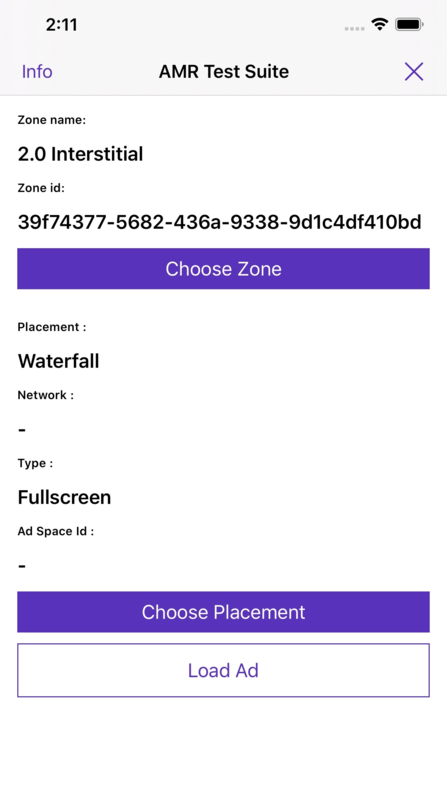 You can use Test Suite to test your ad networks with your zone ids. You must be a Tester to show Test Suite on devices. transactionId – Transaction identifier of SKPaymentTransaction. currencyCode – Currency code of transaction. amount – Amount of transaction. You can use cacheBanner method to cache your banners before showing them. You can use the following method to set application specific user id in Admost Analytics for enhanced tracking of your users. You should to call this method before initialization. You can use the following method to set Adjust user id in Admost Analytics for enhanced tracking of your users. For rewarded video ads, you can use Server to Server Callbacks for rewarding users after successful completion of video ads. Please consult your business contact person for enabling it and setting required parameters like callback URL, request verification token and method. To use this feature, only requirement on application side is setting your application user id as described here. You may also add new custom parameters to the callback URL by setting custom data to the rewarded video object AMRRewardedVideo as shown in the sample code below. This method has to be called before showing ad.